When you mention the big boys of aluminium PC cases and accessories one of the first brands that springs into mind is Cooler Master. With their reputation for producing good quality, albeit pricey, cases the opportunity to take a look at the latest horse in their virtual stables was one we couldn't resist. 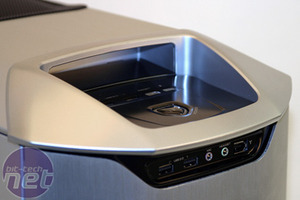 The beast we'll be looking at today is the Cooler Master Stacker 830, which with a retail price at the time of publishing of around £180 will have to show us the right stuff to impress us. 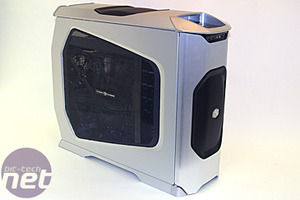 It's a lot of money for a PSU-less case, so let's see exactly what you will get for your hard earned cash. It's certainly a solid case - on first removing it from the massive, well padded, box we were greeted with what can only be described as an ode to solidity. The entirely reversible front door opens with ease and the sheer weight of it gave me confidence that it wasn't going to be damaged easily through normal use. The door is kept shut by a pair of magnets, ensuring the door stays shut without the need for components that might wear with time. The design is loaded with Star Trek-like curves which give a false impression of size - make no mistake, this case is not small! At 21" (54cm) in height, 10"(25cm) in width and a massive 25"(64cm) in depth, you will need to think carefully about placement of it as most desks will struggle to accommodate such dimensions. Nevertheless, if you can find space for it, there is no doubt that it will get you noticed. It's very spacious inside, but more about that later. The carrying handles for the 830 are concealed in the front and rear front of the lid. We found these essential, as when fully fitted out the total weight made even the strongest amongst us wince. 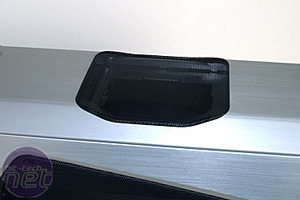 Dead centre of the top of the case is equipped with a grill covering a 120mm fan mount, perfect place to put a small watercooling radiator if you trust the watertightness of your fittings and want the heat to escape directly out of the top of the case. We have a watercooling kit we will be trying this out with so watch this space. 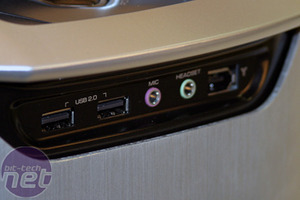 The power and reset buttons are located just below the front carrying handle, together with two USB 2.0 sockets and the reset button, which unusually illuminates blue along with the HDD activity light next to it. We have a feeling that the USB ports will rapidly fill up with dust and the black plastic tray wont be far behind in the dirt magnet stakes, so don't forget a soft cloth to wipe it clean every couple of days if you want to keep it looking good. 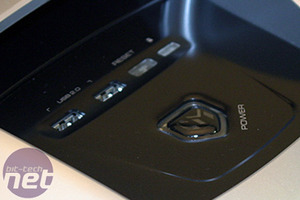 Some of you may have noticed that the perspex Cooler Master badge/power button has a bit of a Transformers look about - this is also is brightly illuminated in blue. On the front of the case you can see another two USB 2.0 sockets, the front audio connectors and a Firewire connector. I have never really been a fan of visible connectors, but we think these are integrated well enough into the design to look classy. 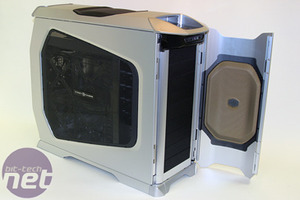 CeBIT 09: Corsair cases? TEC cooled memory? Crazy but cool comes to mind.